Make sure to Like us on Facebook to keep up to date with the latest products and specials that we offer! LOCATED ON THE SQUARE IN MOUNTAIN VIEW, AR. WALLACE WOODWORKS.... A LITTLE MORE THAN JUST A FURNITURE STORE!! 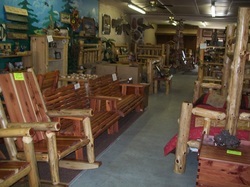 AT WALLACE WOODWORKS YOU WILL FIND A VARIETY OF ITEMS RANGING FROM INDOOR AND OUTDOOR LOG FURNITURE, TO RUSTIC AND WESTERN HOME FURNISHINGS, TO HANDMADE ITEMS AND CRAFTS. WE HAVE TWISTED H LEATHERWORKS LOCATED INSIDE OUR STORE THAT MAKES A VARIETY OF CUSTOM MADE LEATHER ITEMS INCLUDING BELTS, WALLETS, KNIFE SHEATHS, PURSES, JEWELRY, BIBLE COVERS JOURNALS AND MUCH MORE. WE HAVE ADDED JEWELRY, PURSES, HANDMADE WOODEN SPOONS AND BOWLS, HUGE VARIETY OF APPAREL AND SOUVENIR ITEMS, JELLIES, JAMS, SALSAS, CANDLES, HANDMADE SOAPS AND SO MUCH MORE!!! KEEP IN MIND OUR FURNITURE IS CUSTOM MADE TO FIT YOUR NEEDS. WE ALSO DO STAIRCASES AND PORCH RAILINGS!!! GIVE US A CALL NOW TO SEE HOW WE CAN HELP YOU WITH YOUR PROJECT!! AND LET US GIVE YOU A QUOTE! Located inside our store is Twisted H Leatherworks. Lance and Beth Hames, owners , are now set up inside the store where they hand make custom leather products, including Belts, Journals, Bible covers, Earrings, Bracelets, Purses, Key chains and much more. Some items can be done while you shop and others can be ordered and shipped (if needed). This awesome service was added to our store last September. Come by and check them out or give them a call at 870-269-6777. You can also like them on facebook at Wallace Woodworks or Twisted H Leatherworks. We are a family owned and operated business located in the heart of the Ozark Mountains in Mountain View, Arkansas. Established in 1997, we offer a full line of red cedar furniture that includes everything from outdoor furnitures such as swings,rockers, picnic tables, etc... to a complete line of household furnishings for every room in your house. Everything is made by hand and so we can give each piece that we make its own uniqueness and originality. This is top quality merchandise and there is absolutely nothing factory-made about our products. TIme and care is put into each piece that we create. We have a retail outlet in Mountain VIew where all of our items can be purchased and have a list of customers that we wholesale to in surrounding towns and states to make it little more accessable for our customers.. Please feel free to ask any questions that you have about our products and buy confidently as we back our products with a warranty!